Schools around Eeyou/Eenou Istchee joined the national “Jersey Day” April 12, 2018 in honour of the victims of the tragic bus crash involving the Humboldt Broncos. The crash, which occurred April 6 while the team was on its way to Game 5 of its series in Saskatchewan, claimed the lives of 16 members of the team, and injured another 12. And the tragedy hit close to home for many in our Cree communities where hockey and broomball tournaments are a weekly activity during the winter months, often involving extended travel on treacherous roads. 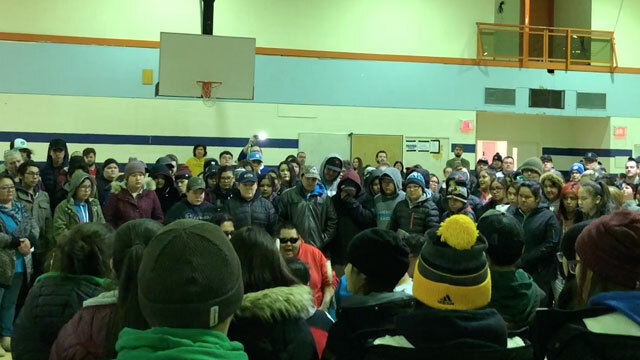 “It’s a way for us to pay respect,” said Wabannutao Eeyou School Community Education Officer Margaret Cheezo. Many in Eastmain, including Cheezo’s grandsons were away at a tournament the same weekend the crash occurred. Cheezo and the school administration team were among the many in our schools who helped encourage students and colleagues along with the entire community to erase the miles between Saskatchewan and Quebec, to show empathy and compassion to the families of the Humboldt Broncos, and to grow in their own understanding of the fragility of life, and the importance of kindness. The Eastmain students marched to the arena where they held a vigil. Meegwetch to all educators that grasped this teachable moment!